It is always good to ask your doctor about using exercise equipment after a total knee replacement. Certain equipment will be commonly used in Physical Therapy and may be appropriate for you to use after you’ve completed PT. 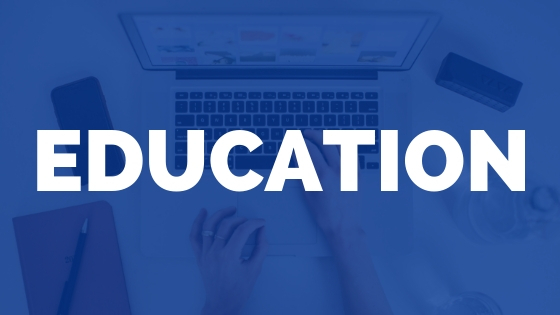 The first thing I recommend is to make sure your physician approves for you to walk unrestricted and is OK for you to use exercise bikes or ellipticals at home. I generally start my total knee replacement patients on an upright bike within 2 weeks of surgery. Sometimes I’ll start them earlier – it just depends on where they are in their motion and pain level. You’ll need at least 100 degrees of Knee Flexion to ride an upright bike comfortably. If you have less motion than this, you may need to start with “half rotations” moving forward and back until you can make a full revolution. Often times, it’s easier to start with full revolutions in reverse. My main caution to patients is to go slowly and to avoid hiking their hips significantly. Using a recumbent bike after knee replacement surgery can be an easier way to start and usually requires less knee motion to use. 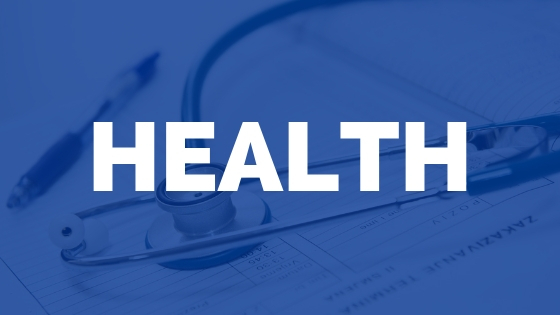 (Be sure to check with your doctor or PT about using a bike after a total hip replacement). In many cases after a hip replacement you’ll need to follow certain precautions. This means that you’ll need to avoid moving your hip into certain directions. In this case, you may need to avoid upright bikes that stress your hip into flexion beyond 90 degrees. A recumbent bike may be a better option for you because you can better manage your precautions while getting in and out of the bike. I’ll list a few of the best recumbent bikes below. Exercise Parameters: How Long or intense? Before you even consider purchasing exercise equipment after your hip or knee surgery, you should be aware of a safe approach to using the equipment. If you have a PT, you can ask them how long you should perform a cardio activity like walking, riding a bike or elliptical. It’s helpful to have a heart rate monitor on your equipment so you can track your response to the exercise. The American Heart Association recommends at least 150 minutes of cardiovascular exercise per week, a great goal to work towards after you’ve completed your PT and are cleared to continue with exercises on your own. Early goals for total knee replacements are to use a no resistance (if possible) and to focus on good motion for 5 to 10 minutes to start. Increasing your time to 20-30 minutes should happen gradually and safely under the recommendation of your doctor or physical therapist. Let’s take a look at the best recumbent bikes available. These are generally easier to get in and out of and are very easy for the majority of patients to use on their own. Pros: “Sturdy” “Smooth Ride” “Comfortable” – Most of the reviews of this bike on Amazon are really high. Most people really like how comfortable the bike feels and how easy it is to use. Other perks: USB port, speaker, and media platform. Cons: “Pretty Heavy” “1-2 hours to assemble” – It’s common to misjudge the weight of an exercise bike like the Schwinn 230. Personally, I’d rather it be sturdy than light and unsteady. As a plus, you can pay extra on Amazon and someone will arrive and assemble the bike for you. Pros: “Great value” “Solid bike” “I’m 6’1” -plenty of adjustment for me” – Most of the 2,000+ reviews of this bike on Amazon are strong. Most people really like the value of the bike and how easy it is to use. Other positives: 300# weight max and 3 year warranty. Cons: “Instructions hard to follow” “Seat is not as comfortable” – This bike is notably cheaper than some bikes, but as the saying goes, you sometimes ‘get what you pay for.’ It still does the job! Just don’t expect this bike to perform like a $700 bike! Pros: “Impressive” “Very nice bike” “Similar to my gym’s bike” – As with the other recumbent bikes, this option has high reviews on Amazon as well. People tend to assemble the bikes on their own within 2 hours. Other positives: USB charging port, grip heart rate monitor, speaker system. Cons: “Prefer a upgraded seat” – The reviews of the seat comfortability varies among reviews. One of the reviewers remarked on how the seat felt unsteady, but it’s hard to pinpoint this to manufacturing error or assembly error. If you have a preference for using an upright bike, these may be a good option. In many Physical Therapy clinics, upright bikes are used in rehab, so if you’re comfortable with this type of setup, take a look at some of these options for upright bikes. Pros: “Great bike” “Smooth ride” “Similar to my PT clinic” – I absolutely love using the Schwinn Airdyne with my patients in the clinic after their total knee replacements. While it’s a little more expensive than other bikes, it’s a fantastic bike that will last for a long time. 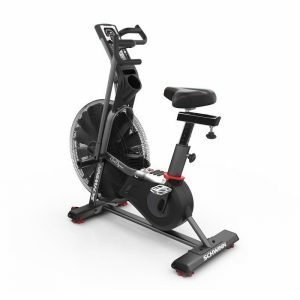 Cons: “Expensive” – The Airdyne is a little more expensive than the other options, but it’s no surprise that you’ll find a gym quality piece of equipment with this bike. Pros: “Great bike for the price” “Easy to Put Together” – I’ve had great experiences with the Schwinn brand and while this bike is one of the lower models of Schwinn, it looks well constructed and should be a solid machine for improving your mobility. Cons: “The assembly is complicated ” – Not unlike the reviews of multiple upright bikes, the assembly on this one seems to be a little more involved than people anticipate. Expect to spend 1-2 hours putting together the bike or spend an additional $100+ on having an expert assemble it for you. Pros: “Comfortable, smooth, and quiet” “Simple Assembly” – For $130, this bike is hard to argue with on price. It gets the job done according to 5,000+ reviews on Amazon, but don’t expect it to be a top tier Physical Therapy quality bike. For the home, it seems to be a good option for those on a budget. Cons: “Cannot swap out seat” “rubber straps for pedals are cheap” – While this bike may be easier to assemble and overall cheaper in price, it may come at the cost of fewer modifications like changing out the seat and possibly enduring some cheaper features than the other bikes listed above. Some of my patients ask, “Can I use an elliptical after my knee replacement?” Since ellipticals are very low impact on your joints, this should not be an issue for most people. It’s always best to check with your surgeon, especially on the timeline to return to using an elliptical. As with any recovery from surgery, your return to using equipment like an elliptical needs to be gradual. Don’t jump on your favorite elliptical for 30 minutes as soon as you’re cleared by your doctor or PT. Ease into the equipment, increasing your tolerance by a couple of minutes each session over a couple of weeks until you’re at a comfortable level. Pros: “Very Sturdy” “Highly recommend” The newest version of the Schwinn 430 is gaining traction as a very reliable elliptical that gives you a gym quality at home. Cons: “noisy at first” The most common complaint is that the elliptical isn’t the most quiet machine on the market. Some even had to apply a lubricant to decrease the sound of the machine. Pros: “Quality Product” “Great Price” – A lot of reviews of this elliptical describe it to be a solid, smooth machine that feels great. While it’s not as large as other ellipticals (a plus for some people) it delivers a good workout at a reasonable price. Cons: “Speaker not as loud” “Takes 2 hours to build” Like other ellipticals and bikes, you can expect to spend 1-2 hours to assemble the unit. This would be considered an entry level elliptical but certainly more advanced than some of the cheap ellipticals on Amazon. Pros: “Just like the one at my gym” “Great machine” – There is no question why this elliptical has all 5 star ratings on Amazon. It’s a well built, commercial quality machine that is reliable and sturdy. I personally own a Precor machine and can attest to the quality of their equipment. 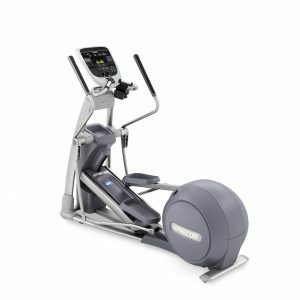 The ellipticals are no exception and if you want to invest in a quality machine, check out this one. Cons: This machine is a bit expensive, so it won’t be for everyone. It’s not the cheapest machine, but it may be one of the smoothest ellipticals you’ve ever used. After your knee or hip replacement, you should continue to strengthen your hip and legs based on the safe exercises you learned in Physical Therapy. 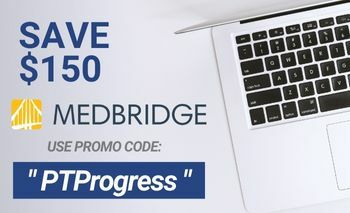 Some of the most common pieces of equipment you use at the PT clinic can be purchased for less than $200 for you to use at home. As I always like to tell my patients, your new knee will continue to feel stronger over time. 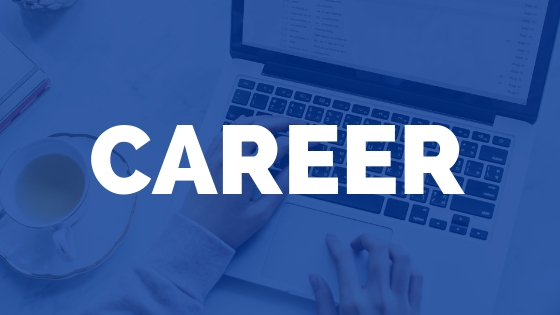 Even though you’re done with PT, it’s your job to continue to strengthen it on your own. Here are some of the most common pieces of exercises equipment I recommend for people with a knee or hip replacement. (It might be helpful to have these items before your surgery so that you have them during your rehab. Usually within one day after your knee or hip replacement, you’ll start doing exercises to strengthen your quads and glutes. A foam roll is very commonly used at PT clinics to perform an exercise called “Short Arc Quads.” This is a very effective exercise used to engage the quadriceps muscle, a primary muscle that is used with walking and standing. Simply place the foam roll under your knee and extend your knee to straighten it. One very important element of rehab after a total joint replacement is to improve your balance. You might use an Airex Balance Pad at rehab, which is a soft square pad that provides an uneven surface. This is a good challenge to your joints and helps to improve your balance. If you decide to purchase one of these for home use, be sure to set it up in an area where you can use arm support as you need in order to avoid falling. Using ankle weights is reserved for later in your rehab. When you are ready to start using resistance into approved movements, it might be convenient to add ankle weights to your home exercise equipment list. I like to recommend the ankle weights with adjustable weight slots, which is usually cheaper and more convenient than storing multiple sizes of weights. Your doctor may or may not provide you with an ice machine after your surgery. Ice is used to help decrease swelling, inflammation, and to help with pain. Your PT may recommend the use of ice at home, so if you’re looking for the same kinds of ice packs used in PT clinics, here is a link to the ones I use in my clinic. Do you absolutely need to purchase this equipment after your joint replacement? No, people often see good results by using equipment at the rehab clinic. But it’s up to them to continue with exercises on their own. If you want to save money on gym fees, look at some of the above recommendations. If you see the value in following the American Heart Association’s recommended guidelines of 150 minutes of cardiovascular exercise per week, then a bike or elliptical may something you give serious consideration. I had a hip replacement , what about using resistance bands with hip exercises? Resistance bands can be useful for strengthening the hip muscles after surgery. It’s important to ease into these, otherwise you may risk injury. I recommend focusing the first 2 weeks on safe movement patterns and body weight exercises such as straight leg raises, mini squats, and standing hip kicks as directed by your Physical Therapist. As you become stronger and more steady, your PT will progress you with resistance band exercises. Usually with a resistance band that is tied in a circle to be placed around your knees or ankles. Remember, if you’ve had a hip replacement, you’ll want to maintain the hip precautions set by your physician. I had a ball replacement in my hip. I have to be careful when pedaling that my leg does not rise higher than my waist. You didn’t give the bike that would be best for hips. My PT said to get a recumbent type. What do you recommend? The Schwinn 230 recumbent bike (see above) is a good option for people with a hip replacement. This bike can adjust so you do not break the precautions of 90 degrees of hip flexion. No sense asking readers to ask questions if there are no answers. I am 7 weeks after hip replacement. Would an exercise bike be good for me ? Also standing up on the pedals. Would this be safe. 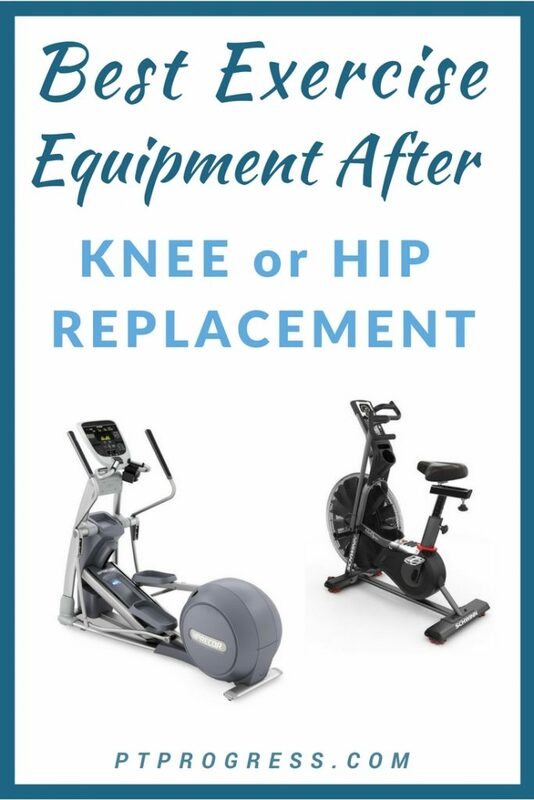 On a Facebook page for TKR patients, it’s been said that elliptical machines are dangerous for TKR patients because of “drag on the knees,” in which the motion could cause the lower part of the new joint to pop out from the upper part of the joint. Several patients responded that they, too, had been told by their PTs not to use the elliptical machine. I had hoped to purchase one for my home, not only to continue strengthen my knees (bilateral TKR), but for weight loss. Have you heard of this “drag on the knees” claim? What do you think? I have not heard of the ‘dragging’ effect and would be very surprised to see the components of a total knee to ‘pop out’ from use of an elliptical. An elliptical will produce more force than simply walking on a treadmill, but I’ve never heard it to be a dangerous force that people should avoid after a TKA. I would trust the opinion of your PT as they have evaluated your circumstance. How do you feel about under desk bikes or ellipticals for total knee replacement?